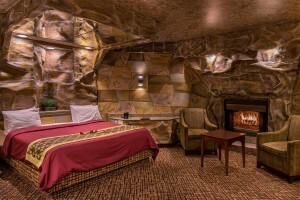 The Black & Gold theme suite with Hot Tub and fireplace comes with a round four post king size bed with overhead mirrors. 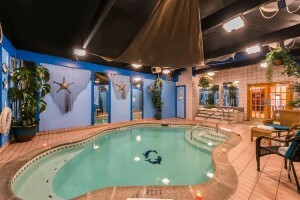 This suite comes with a walk-in shower with two shower heads, wet bar, and a Flat Screen TV with Adult Channels. 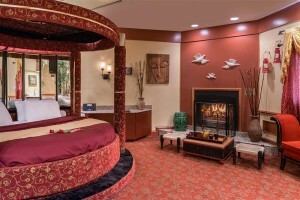 Our elegant themed Asian Suite is one of a kind and has special decor unique from all other. The bed is rounded with a four post canopy bed. 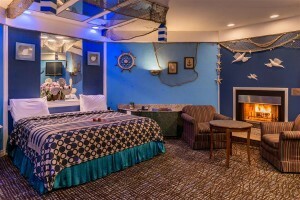 The Blue Romantic Suite consists of a king size bed with special decor as if you are on a cruise ship or at the beach just without the sand. This suite comes with a walk-in shower with two shower heads, wet bar, and a Flat Screen TV with Adult Channels. The Deluxe Romantic Suite with a king size bed comes with a Hot Tub and fireplace. This suite comes with a walk-in shower with two shower heads, wet bar, and a Flat Screen TV with Adult Channels. Our top of the line suite, enjoy all the amenities as the deluxe suite plus your own private heated indoor swimming pool with a hot tub all surrounded by mirror walls. This suite comes with a walk-in shower with two shower heads, wet bar, and a Flat Screen TV with Adult Channels. The Honeymoon Romantic Suite is the next best thing; this room type comes with the same amenities as the deluxe suite but comes with a oval shaped hot tub for two that is located just behind the head of the bed and surrounded by mirrored walls. This suite comes with a walk-in shower with two shower heads, wet bar, and a Flat Screen TV with Adult Channels. 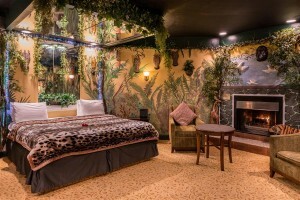 Tarzan and Jane never had it so good, our jungle themed suite is perfect for that get-a-away with that special someone. 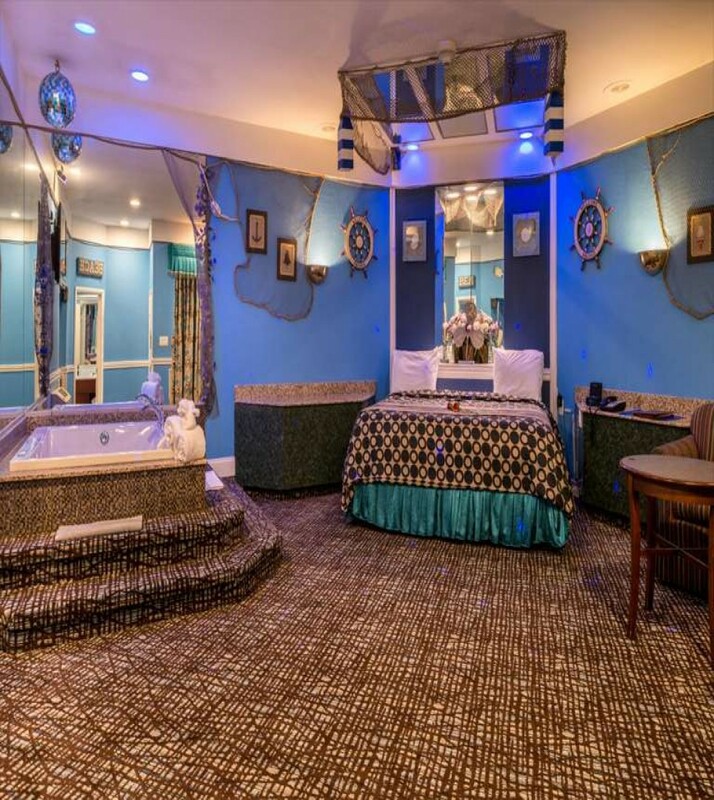 This suite comes with a walk-in shower with two shower heads, and a Flat Screen TV with Adult Channels. Get comfortable with our Red Romantic themed suite which comes with a king sized bed with an overhead mirror. This suite comes with a walk-in shower with two shower heads, wet bar, and a Flat Screen TV with Adult Channels. Our Sweetheart Suite is the perfect suite for that special occasion, relax with each other in the king sized four post heart shaped canopy bed and hot tub. This suite comes with a walk-in shower with two shower heads, wet bar, and a Flat Screen TV with Adult Channels. 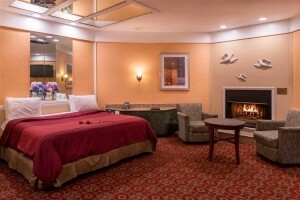 The Deluxe Romantic Suite Accessible room with a king size bed comes with a Hot Tub and fireplace. This suite comes with a roll-in shower with two shower heads, wet bar, and a Flat Screen TV with Adult Channels.